Take to the Air this summer! Designer Kelly Panacci has given us a terrific group of 21 prints featuring Yellow, Blue, and Grey. Of course all the prints mix and match with each other! 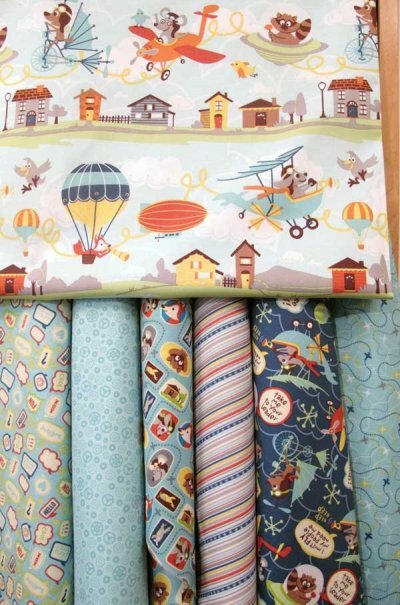 There's an adorable large print with puppies, racoons, and foxes flying an assortment of aircraft over a village. A medium print features the animals conversing as they zoom through the air! Supporting prints include flight paths, gears, tiny stripe, talk, and patches. Helicopters, biplanes, and jets offer a variety of modes of flight. Add red insignias and light blue propellers to accent pockets and borders. These look terrific in shirts and shorts! GIVEAWAY! - There's still time to enter! We are excited to announce that we have ONE Complimentary Event Ticket for this summer's Applique Getaway. This ticket is good for one event admission for both Shopping and Classes! If you have already registered for this great event, don't worry - you are still eligible to enter and win; a refund will be given by the event organizers. How to enter - use our "Contact Us" form and tell us why you'd like to win. One lucky winner will be selected THIS week. You must register for the event/ redeem the coupon by June 30th. Our next show is Applique Getaway in Ft Worth, TX July 18, 19th.